In these turbulent times, former President of South Africa F.W. 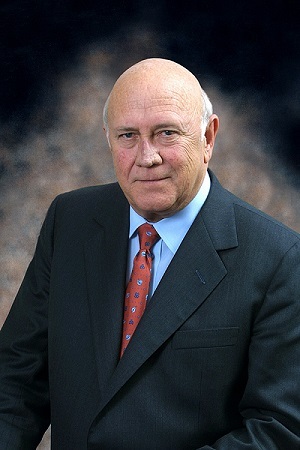 de Klerk offers powerful perspective on the importance of peaceful resolve in even the most difficult disputes. Few world leaders have confronted injustice with as much conviction and political deft as F.W. de Klerk. Shortly after his election as president of South Africa in 1989, de Klerk released Nelson Mandela from prison, and their joint efforts to bring reform to the country earned them the 1993 Nobel Peace Prize. By the time his term ended, de Klerk ended every discriminatory apartheid law and presided over the country’s first-ever multiracial elections. Currently the chairman of the Global Leadership Foundation, de Klerk enlightens audiences with his unique perspective on current global conflicts that affect the interests of all individuals. With stirring tales from his illustrious career, he inspires listeners with a simple message — that true reform requires courage in the face of resistance.